A business entity can be registered through the Secretary of the State office in that state but before you do so, you need to ask, “do I require a business license in Connecticut?” Depending on the industry and location of your business entity, you will be required to apply for a business or professional license or permit. Generally, a license to conduct business is issued by the state and local government and this includes cities, counties, or even towns but some businesses may be required to obtain license from the federal government as well. Insurance Company License (Domestic) – This type of business license allows domestic Connecticut insurance companies to operate in the state. The licensing agency is: Department of Insurance. Commercial Fishing – This type of business license is required by tourism cruise vessels; commercial fishing vessels; and fishing vendors or vessels that aid in the import of live fish. The licensing agency is: Department of Energy & Environmental Protection. What are the requirements for obtaining a business license in Connecticut? Does your business entity require any special permits? Does your business require a single license or multiple licenses? These are some of the important questions that you might be confronted with and hence, we have created a guide that will help answer some of these questions. You are planning to start a business in Connecticut and you have chosen to start a Restaurant that serves alcoholic beverages. What are the various requirements? 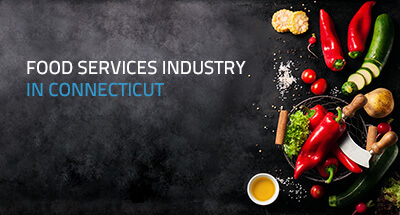 The “food services industry” in Connecticut include a variety of businesses like restaurants, cafes, delis, coffee houses, catering services, clubs, and even food trucks. If you have chosen the restaurant business then the first step is to contact the “local health department” in the city, county or town of operation to obtain a business license in Connecticut for food service. The food license fee for a restaurant will vary according to the seating capacity of your establishment. For example: Business license & service fees for an establishment in Stamford, CT with seating capacity of a maximum of 15 people is $28.00 while the fee for an establishment with seating capacity of 200 people is $559.00. If you also offer catering services then you will have to pay an extra fee of $420.00. Since, your restaurant would be serving liquor or alcoholic beverages in premises then such an entity would need to also obtain a “liquor license or permit”. The liquor permit is a business license that will be issued by the State of Connecticut, Department of Consumer Protection, Liquor Control Division. The application fee for the same is $100.00. You can check a sample of the application here. It is important to note that a single business depending on the industry and type of operation may require multiple business licenses or permits.